A lot of people consider the job application process to be a one-way street: A prospective employee sends in their resume and attempts to impress an employer with their skills, their personality, or a combination of both. If they make a good enough impression, they get the job. What many don’t realize is that this street actually goes both ways. As an employer, your company needs to be appealing to prospective employees, too. You don’t want to simply fill positions for the sake of having a staff. You want to bring in skilled experts at the top of their field who will help drive your business toward growth and success. Your company isn’t just some faceless machine, after all. It has its own culture and personality, which may not always be evident from the outside. And if you’re in an industry where talent is at a premium, you need to present it as a great place to work. Otherwise, those great employees will go work for the competition. So, how do you show the world how awesome it is to work at your company? One of the best places to start is through the content you produce. A team is only as good as its weakest member. This is an old adage, but it rings especially true in the professional world. Your ultimate goal as an employer is to assemble a dream team of the industry’s best and brightest. Without effective employer branding, you might find that difficult. 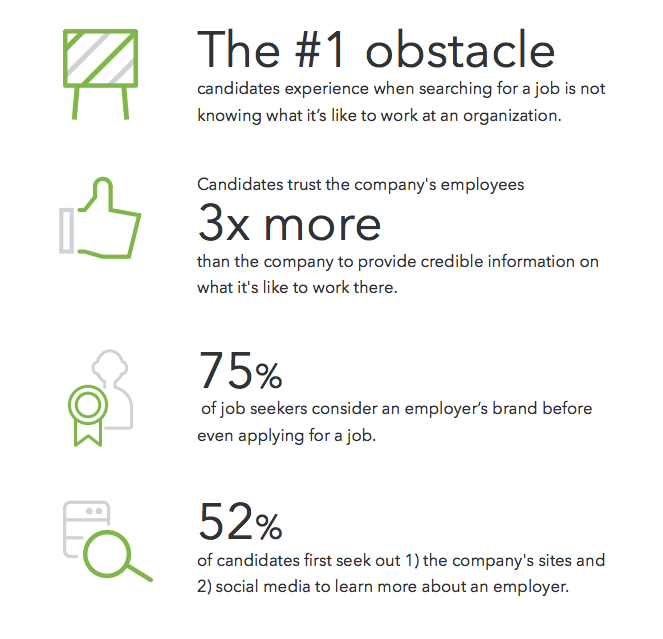 According to LinkedIn, an employer's brand matters to 75% of prospective employees. That means they check out reviews, social media channels, the company website, and whatever else the company has put out there. If there’s not much out there—or if what is out there is just bad reviews—the chances of them moving forward with applying are low. With little or poor employer branding, you’re likely to end up with a less capable staff and higher employee turnover over time, which could derail the productivity of your entire organization. What Kind of Content Helps Employer Branding? 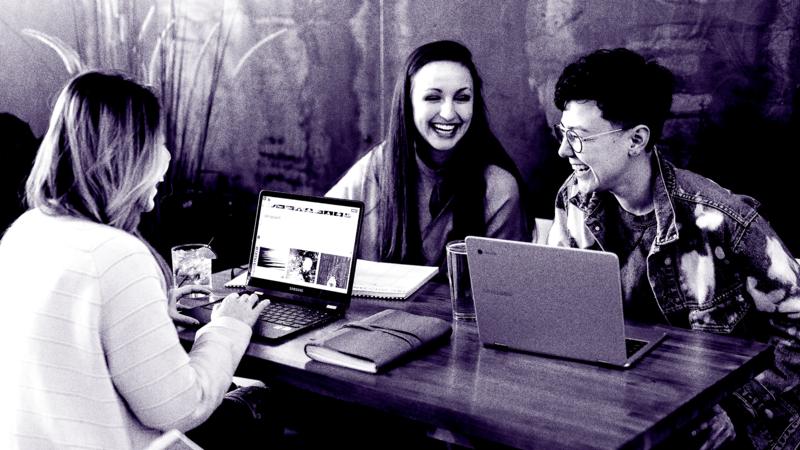 While recruiting and hiring is largely under the jurisdiction of the human resources department, marketers tend to become involved when it comes to the public-facing image of the company. For better or worse, everything viewed and considered by prospective customers can and will be viewed and considered by prospective employees as well. Luckily, there are various types of content that are probably already in your arsenal that you can cater specifically to job seekers. One of the first steps a business should take in order to build up their employer branding is to devote some time to producing some company-centric video content. We’re a very visual society—you can do a lot by showing people the inner workings of your company, rather than just telling them. The ability to see a positive work atmosphere and hear from the people already in it can do a lot to encourage new prospects to apply. It’s important to talk about company culture in these videos. Don’t just rattle off a list of qualifications or superficial perks. This is an opportunity to show the actual personality of your business, explain why it’s an exciting and fulfilling place to work, and encourage quality candidates to join. This is a tactic used by some of the largest companies in the world. Take Apple, for example. Their employee recruitment video has everything from upbeat music to b-roll footage showcasing a positive environment and employee testimonials. Starbucks took on a similar strategy in their video, highlighting the positive work atmosphere that would draw in quality candidates. While Apple’s video clocked in at just under five minutes, Starbucks went with a shorter approach, creating a video just over two minutes long. Even government organizations use good employer branding to entice recruits. Take this video created by the Royal Canadian Mounted Police, for example. It takes a completely different tone, selling national Canadian pride and making the role of an RCMP officer look fulfilling and exciting. Once you’ve created your video, you can share it on every platform you have available: your website, social media, job listings, emails, and more. It’s even something that you can play for a prospective employee on the day of their interview to give them some more information about the company they’re trying to join. Your website can do more than just sell your product or service. It’s the core of your entire digital presence—the place in which the voice of your brand lives. This voice exists not just to communicate with customers, but to entice prospective employees and show that you’re a major player with which they should want to seek employment. These are all things we kept in mind when we were redesigning our own website this year. Our people are our greatest asset, after all, so we incorporated them directly into the new design. Again, your company isn’t some soulless, faceless entity. There are actual people behind it—people that you hired for a reason. Why not give them the spotlight and give job seekers an idea of who they will be working with? These days, it feels like everyone is on social media. It stands to reason, then, that your prospective employees will be too. Thus, it can be a great place to reinforce your employer branding and showcase your company culture in real time. In fact, there are a lot of organizations out there leveraging social media this way. Some of them may be your competitors with their nets out for outstanding talent. If you’re already sharing glimpses into your company on social media to help humanize your brand for customers, this should be a no-brainer. You can bolster your employer branding by highlighting a different employee every month or celebrating big team wins. You can also share pictures from team events and the general day-to-day goings-on of your office. 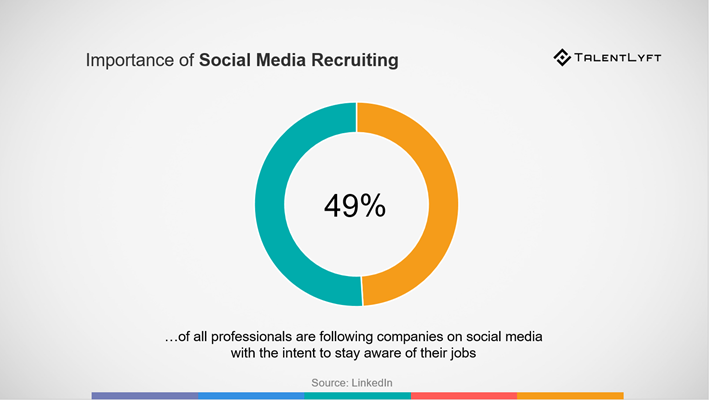 Some brands take it a step further, dedicating entire social profiles to recruiting and their employer branding. One excellent example is Procore, who develops construction management software. They have a Procore Jobs account on Twitter that lives separate from their main Twitter account and focuses on life at the company. Of course, you don’t have to double up on profiles to make social media work for you. Just the act of being transparent can go a long way with people. Make sure you’re responding to feedback, engaging with fans of your brand, and sharing updates on the direction of the company regularly. Show that you care about your staff and your customers, and you’ll start to attract employees that will too. As with customers, powerful content is the best way to attract the attention of the best and brightest workers your industry has to offer. Through the creation of strongly branded content that highlights life at your company, you could see a substantial increase in the quality of your applicants, as it will attract people who want to work for a company that is in line with their values and their work ethic. So share the story of your company. Put your employees in the spotlight. Don’t be shy about your mission and the good work you do. Let prospective employees clamor to work for you, and see how much your business will grow over time.